The school library is within the Hanly Learning Centre and is open from early morning into the evening for use by day and boarding students. The Library offers a variety of spaces suited to individual study, small groups and classes in a variety of modes including collaboration, contemplation, didactic teaching and incidental learning. Students benefit from the co-location of complementary learning and support facilities such as the library, the Learning and Teaching department, IT and AV support, classrooms and cafeteria. The architecture is both monumental and welcoming; a confident and handsome addition to an all-boys campus renowned for its sporting reputation. 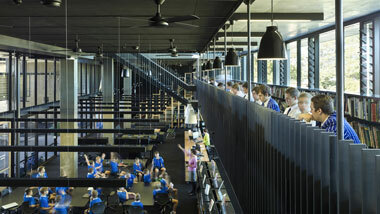 The library is at the heart of the school, taking its rightful place as the key 'resource' space for students. The centrally located facility (on circulation paths) is a beacon to legitimise the pursuit of academic learning. The architecture is striking, welcoming and inspiring. The central commons area is versatile and flexible. Embraced on three sides, it provides a lofty, covered, flexible area for assembly, functions and events. The strategic physical positioning of the centre beside 125-year-old foundation buildings and on the main mall enable the Hanly Learning Centre to be a place of civic importance for ceremonies, ritual and appreciation of the college’s heritage. The learning centre is a hub for learning, drawing together many library and learning-related resources and available for extended hours to suit day and boarding students. A response to the college’s preferred pedagogy of learning as an act, not information retrieval. The books distributed throughout the three levels are accessible and invite discovery of different learning spaces. 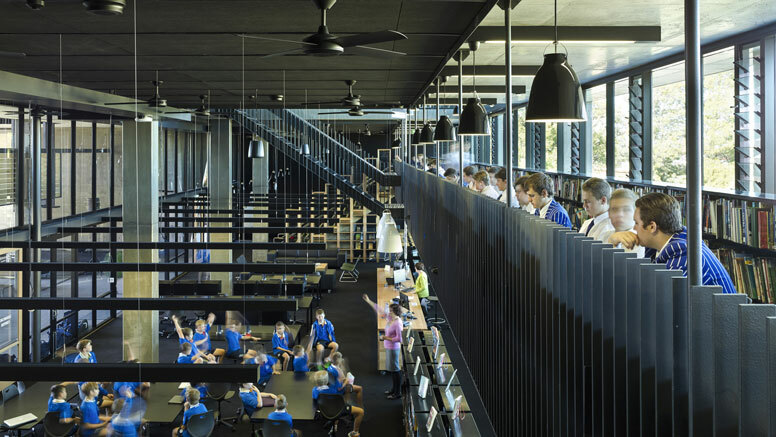 With the books on the fringes though still easily accessible, the focus of attention is on the diversity of learning and teaching spaces available to students. High quality finishes and robust and long-life materials are used. The building remains flexible to change and its passive design and overt sustainability measures are tangible and thus reduce energy demands. It is built on an Epic Theatre concept. It is naturally ventilated with water collection and reuse and good use of shade, I like the tree in the front and the way the building is sited in relation to it. A high-quality building has been achieved for a reasonable rate, representing good value for a building of civic importance. The older library was out of sight and out of mind. The new centre has elevated the relevance and accessibility of library learning facilities and has a refreshing association with other important parts of a campus, namely circulation routes, canteen and socialising spaces. The architect's web page for this project, with more photos.